The Codex Cospi is a brilliantly beautiful illuminated manuscript and belongs to one of the five so-called Codex Borgia group. The manuscript is well preserved, painted on rawhide and protected by two covers from the 17th century, which probably replaced former wood covers. The artistic style of the Codex Cospi bears relation not only to the painted ceramics of the Nochistlan in the Mixteca Alta, but also to the style of the CholulaTlaxcala. The evaluation of style is challenged by an archaeological problem which through excavations to date has been only partially solved. 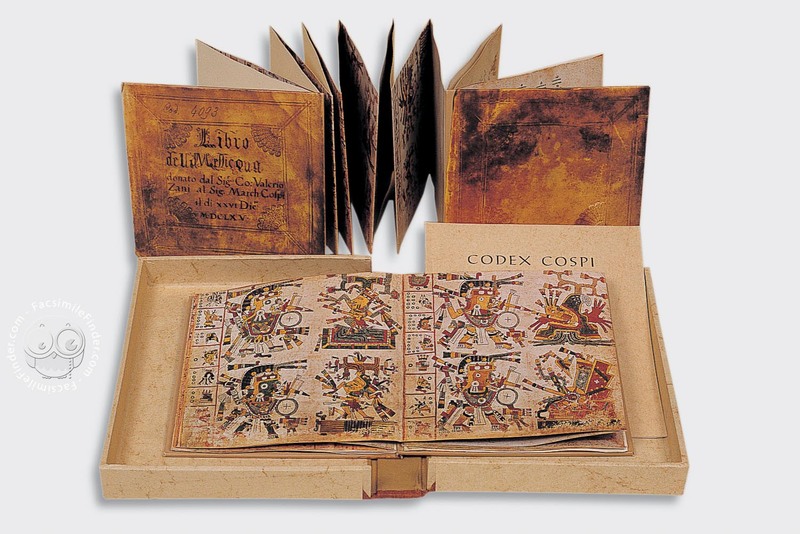 The Codex Cospi consists in the front section of three parts in which Calendar arrangements in tabular form are connected by sequences of pictures. The original empty pages of the back section were at a later date inscribed by hand. Such rituals have been preserved through different acculturative aspects through to the present-day. The selection of days for the rituals is no longer made according to the old calendar but rather according to the different Christian holy days. Manuscript book on parchment − 20 pp. Commentary (German) by Novotny, Karl A.
Full-size color reproduction of the entire original document, Codex Cospi: the facsimile attempts to replicate the look-and-feel and physical features of the original document; pages are trimmed according to the original format; the binding might not be consistent with the current document binding. Encased in box with leather spine. Introduction and summary: 32 pp., 1 plate.